There's a lot of international development news that doesn't make it onto CNN. 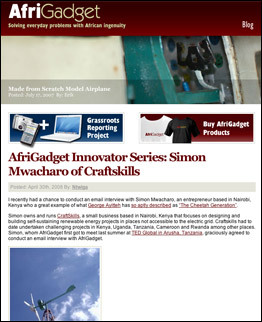 So bookmark AfriGadget, a site dedicated to simple, sustainable inventions in Africa. Recent entries have covered efforts to create biodiesel fuel out of local pine nuts in Sierra Leone, and programs to build bicycles out of bamboo in Ghana and Kenya. AfriGadget isn't updated every day (and sometimes not even once a week), but it offers such distinctive reporting that you won't want to miss a single post. For other good sites addressing sustainable development in Africa, check out the African Uptimist and Timbuktu Chronicles.